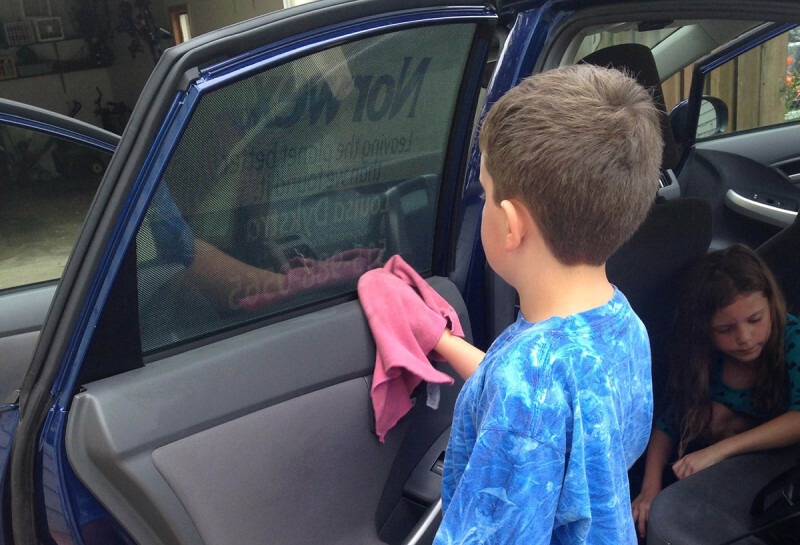 Car Detailing So Easy a Child Can Do It! Our only tools were a handheld vacuum and the Norwex basic cloths with water! Windows so clear you think you’re in a convertible? Norwex Enviro cloth and water to clean and Window Cloth to polish! Cleaning up the dashboard? Norwex Enviro cloth and water. Stains on the seats? Norwex Enviro cloth and water. Old, dried strawberry smoothie that I didn’t know had spilled on the floor in the back seat? You guessed it! Norwex Enviro cloth and water. Can you believe it?? Seriously miraculous! Yes of course I’m happy we didn’t have to use any chemicals, but the bottom line is, it was so EASY! For the outside, I could have gotten out the hose and my Norwex car wash mitt but instead I chose to drive through a gas station car wash, use the cheapest wash, drive home and then polish it with the Norwex car cloth. Gorgeously shiny, streak-free, and because I removed all soap residue with the car cloth, dust won’t stick to it so it will stay cleaner longer! I’ve even heard customers say they’ve washed their car in the garage in the middle of winter with just a bucket of water, the Norwex car wash mitt, and a car cloth. Because you’re not using any soap, you don’t need to rinse with a hose, and it dries so quickly with the car cloth.